edited by James G. Thomas, Jr. 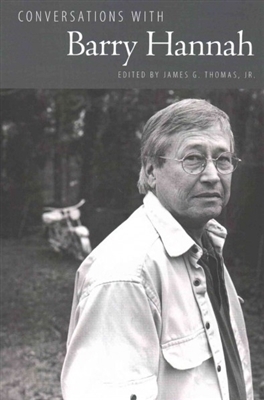 Between 1972 and 2001, Barry Hannah (1942-2010) published eight novels and four collections of short stories. A master of short fiction, Hannah is considered by many to be one of the most important writers of modern American literature. His writing is often praised more for its unflinching use of language, rich metaphors, and tragically damaged characters than for plot. "I am doomed to be a more lengthy fragmentist," he once claimed. "In my thoughts, I don't ever come on to plot in a straightforward way." Conversations with Barry Hannah collects interviews published between 1980 and 2010. Within them Hannah engages interviewers in discussions on war and violence, masculinity, religious faith, abandoned and unfinished writing projects, the modern South and his time spent away from it, the South's obsession with defeat, the value of teaching writing, and post-Faulknerian literature. Despite his rejection of the label "southern writer," Hannah's work has often been compared to that of fellow Mississippian William Faulkner, particularly for each author's use of dark humor and the Southern Gothic tradition in their work. Notwithstanding these comparisons, Hannah's voice is distinctly and undeniably his own, a linguistic tour de force.